Recently I made the decision to transition into a harsh-chemical-free–or at least “free-er”–lifestyle. In order to give myself and my family a strong opportunity to live our best lives, cutting harsh chemicals was inevitable. Harsh chemicals have been linked to depression, respiratory issues, and countless other health issues. One substance which has recently come into question, especially in regard to a potential link to breast cancer, is aluminum-containing antiperspirants. So far, research on whether aluminum in antiperspirants actually causes cancer is inconclusive; however, I prefer to err on the side of caution. Logically, anything that is designed to clog your sweat ducts may become detrimental with long-term use. Also, my son is reaching the age at which he *needs* to wear deodorant. (Help me, Lawd! I’m not ready!) The idea of him religiously applying a potentially harmful chemical on his body at such a young age terrifies me. I might be helicopter-ing or overzealous right now, but as a mom, I have the right to be. When possible, I’m choosing to try to be as natural/homeopathic as possible in an effort to promote health (and to avoid intensifying any ADHD symptoms). That said, I have decided to switch to natural, aluminum-free deodorant. So, I tried 10 different natural deodorants to see which of them worked well, which stained, which smelled delicious, etc. Here’s what I found! Claims: Gluten free, paraben & phthalate free, vegan, non-irritating, non-staining, cruelty-free, baking-soda free. 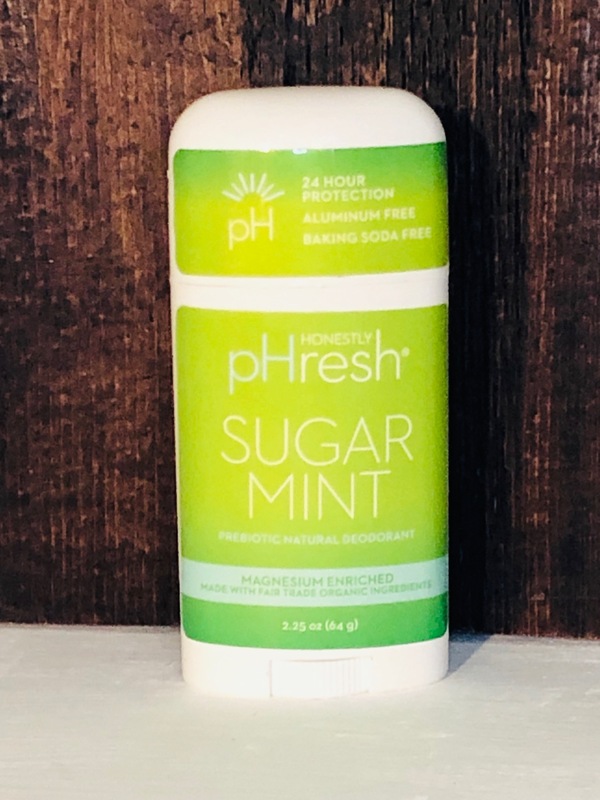 *Disclaimer: Honestly PHresh Sugar Mint was the first natural deodorant I tried. Many experts on the subject suggest there is a detox period during which your body is overcompensating for the time spent wearing aluminum-containing deodorants. The scent of this deodorant is absolutely delicious. It smells like mint herbal tea. I caught myself randomly sniffing my arm pits throughout the morning to get an aroma-therapeutic pick-me-up (awkward). This deodorant is by far the best-smelling in my opinion. The sweet smell of the deo lasted for about half of the day. After the first application wore off, I found myself smelling a bit like a spicy meatball. Another application in the afternoon did the trick to bring back that lovely cup-o-tea fragrance. This stick lasted me a month. I did notice after washing a couple of my shirts that a waxy residue remained under the armpit. It took a deep clean with my Norwex Laundry Detergent and stain remover to get my shirts looking presentable again. 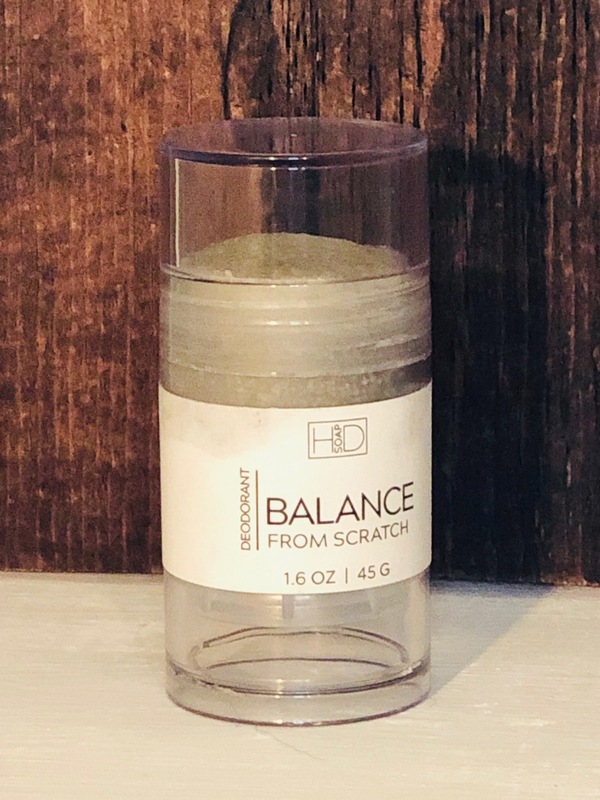 Ingredients (according to label):Arrowroot Powder, Magnesium Hydroxide, Caprylic/Capric Triglyceride, Hydrogenated Avocado Oil, Coconut Oil, Polyglycerol-3 Beeswax, Lavender Essential Oil, Geranium Essential Oil, Tocopherol, Inulin. Rosemary Mint: Arrowroot Powder, Magnesium Hydroxide, Caprylic/Capric Triglyceride, Hydrogenated Avocado Oil, Coconut Oil, Polyglycerol-3 Beeswax, Rosemary Essential Oil, Lavender Essential Oil, Spearmint Essential Oil, Tocopherol, Inulin. Unscented: Arrowroot Powder, Magnesium Hydroxide, Caprylic/Capric Triglyceride, Hydrogenated Avocado Oil, Coconut Oil, Polyglycerol-3 Beeswax, Tocopherol, Inulin. 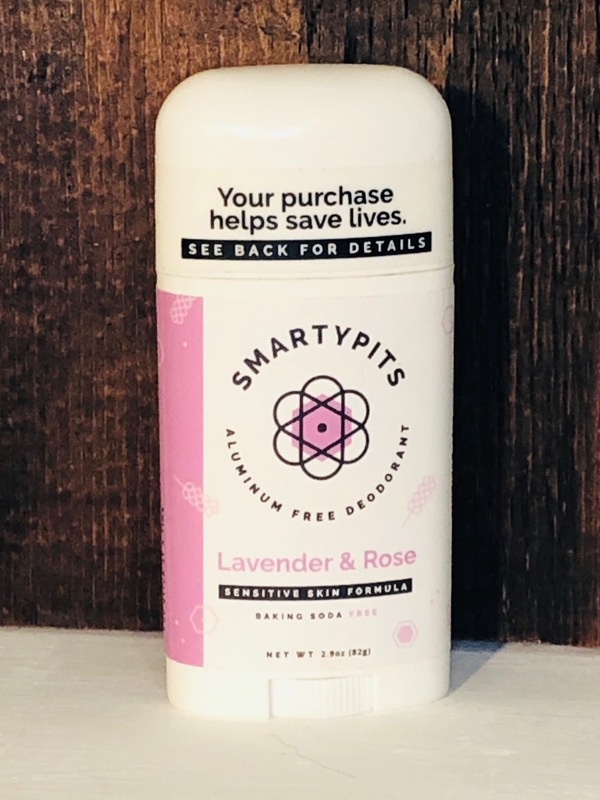 Claims: BPA Free, Children/Pet Friendly, Gluten Free, Made in the USA, Microbiome Friendly, Natural Fragrance, Non-GMO, Not tested on animals, Nut free, Paraben free, Reusable or Refillable, Suitable for Sensitive Skin, Sulfate Free, Supports Charity, Triclosan Free, Baking Soda Free, Women Owned Business, 3% of every sale goes to breast cancer research & survivor support, Contains probiotics to fight odor-producing bacteria, Lasts all day. I ordered Lavender Rose. I’m not sure why, but I missed that they had Rosemary Mint when I first ordered. I would have definitely tried that one. This one smells like lavender. Pretty basic. I am wearing this one as I type and I just smell like a typical health food store. I plan to order the Rosemary Mint, though, and I’ll get back to you. Much less sticky than the Honestly PHresh stick, this one still required pressure to get on. A little body warmth made it easier. This stick lasts pretty much all day. The fragrance isn’t as strong as the Honestly PHresh stick, but it masks body odor throughout the day well into the evening. Ingredients: Magnesium hydroxide, Cocos nucifera (coconut) Oil, Maranta arundinacea (arrowroot) powder, Caprylic/Capric triglyceride (fractionated coconut oil), Butyrosperum parcel (shea butter), Euphorbia cerifera (candelilla) wax, Chinensis (Jojoba) seed oil, Natural fragrance, Tocopherol (vitamin E, sunflower derived). Claims: No aluminum, no propylene glycol, no artificial fragrance, certified vegan & cruelty free, gluten-free. 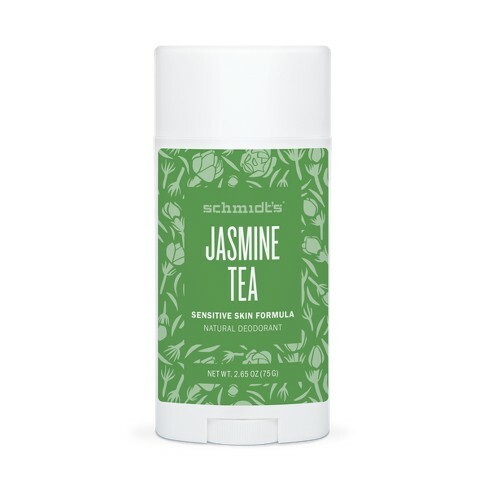 Schmidt’s Sensitive Skin Formula deodorant can be found in several fragrances as well. Via Amazon: Jasmine Tea, Lavender Tips, Charcoal + Magnesium, Tea Tree, and Fragrance Free. You can also find it on Grove Collaborative! The Jasmine tea is another one that just makes me happy the moment I open the container. It smells. so. stinking. good! I also leave the bathroom craving a nice, hot cup of tea. I fervently recommend this fragrance. By now, I’ve gotten pretty accustomed to how natural deodorant goes on, and this one seems pretty par for the course, if not easier to get on. Schmidt’s Sensitive Skin Formula lasted about half of the day for me. I didn’t mind re-applying, though, because it meant a glorious second dose of aromatherapy. An automatic mood lift. I will say, that I did notice staining of the underarms of my shirts. Thank goodness for my Norwex! I LOVE lemongrass. I love the taste of it, and I adore the smell of it. For me, this deodorant smells great. Lemongrass also has bug repelling properties, so that’s an added plus! The texture of this specific deodorant depends on the temperature of the environment. The warmer it is, the softer the deodorant is and vice versa. I found it relatively easy to apply, but am not a huge fan of having to get it all over my fingers. The fragrance and odor control lasted about half of the day. I kept the jar with me so that I could reapply when necessary. The fragrance made the little bit of extra work worth it for me. I also used it all over my body at my son’s exceptionally mosquito-infested cross country meet. I definitely wouldn’t have felt comfortable doing that with your average deo. 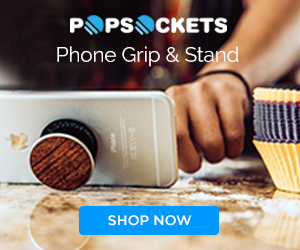 You can find Hilltop Designs products on their website. You’ll find their natural deodorant here. The fragrance of this little deo is a delightful and delicate hint of citrus and ginger. It’s very refreshing! This deodorant comes in one of the smaller containers that I’ve seen deodorant come in. It’s got a nice, soft texture, and goes on easily. I haven’t noticed any stickiness, really. The only downfall of the container is that it can’t be twisted up to access more of the stick. You have to push it from underneath, and it goes back down when you apply pressure to the deodorant (while applying to underarms.) Otherwise, the texture is spot on. I have to say, for just being a little handmade deo, this stuff really works! It lasted me all day every use! Hilltop Designs has truly impressed me with this one. My only complaint (aside from the design of the container) is that it did stain the underarms of my shirts. 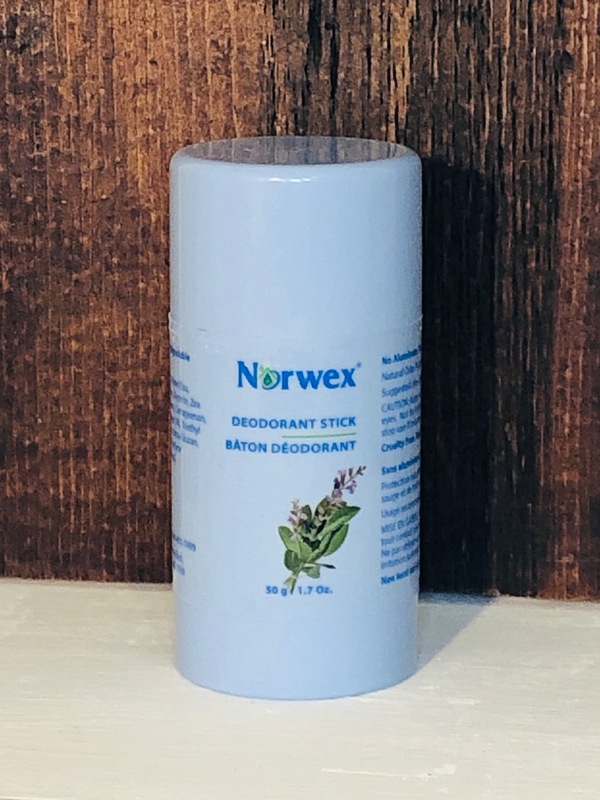 Norwex Deodorant stick has a sweet, floral fragrance to it. It reminded me of a scent from my youth, but I can’t quite place it. I’m a bit indifferent to the smell, because I prefer citrus/mint fragrances. You can shoot me a message, or you can find it here. This deodorant applied very easily—so easily, in fact, that it left my underarms feeling wet. After using these deodorants, I noticed my underarms had sort of a blackish tint to them. It freaked me out! I googled it, and apparently it’s a thing. Baking soda in natural deodorants can throw off your skin’s pH, and can cause discoloration. This doesn’t happen to everyone, but it happened to me; so, from now on it’s baking soda free only! Claims: Aluminum free, baking soda free, made without parabens or preservatives, not tested on animals, made with organic ingredients. In a word: delicious. This deo smells like a Starburst candy. I love it so much! 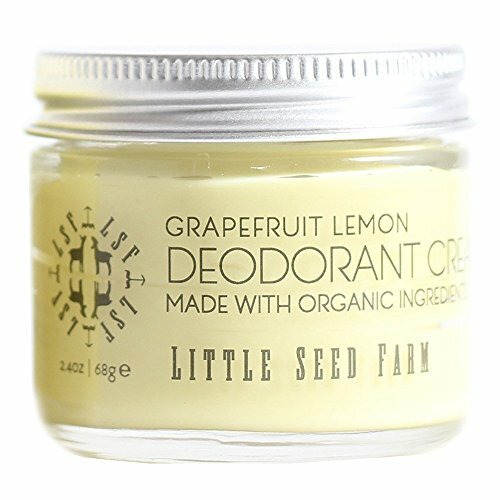 Amazon offers LSF natural deodorant in Grapefruit Lemon and Activated Charcoal. They also have a sampler pack, and these adorable cream deo applicators! You can also find these and their other fragrances (lavender, rosemary patchouli, and uscented) on their website. 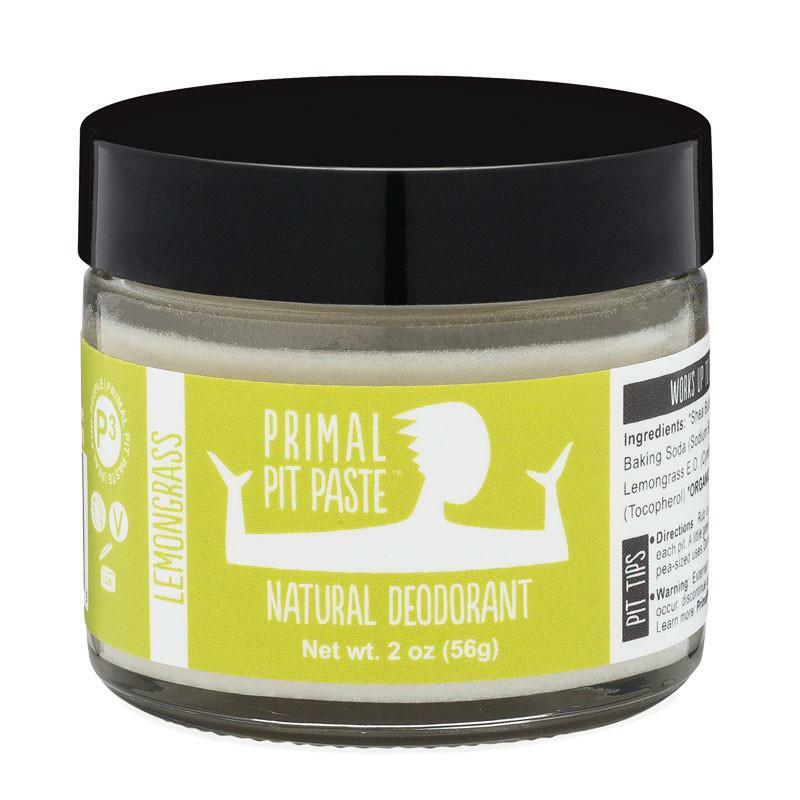 Much like the Primal Pit Paste jar, this deodorant cream’s texture is dependent on the environment in which it’s kept. The cooler the temperature, the firmer the deodorant, and vice versa. I’m still not a huge fan of getting deodorant on my hands–it’s a sensory thing–but this deodorant makes it worth it. This little jar of deodorant worked absolutely wonderfully! It kept me smelling fresh until towards the end of my work day, which is all I can really ask. I’m so pleased with LSF. They are my favorite so far. I know. I know. There are only seven natural deodorants listed, and I promised 10. Honestly, this article has taken me four months to write, and I really wanted to just get the info I’ve collected so far out to you. I have three more deodorants to try, including Lume, Native, and Crystal Mineral Deodorant. I’ll link to the post when it’s complete!